A traditional Victorian influenced high level pan and cistern from Silverdale Bathrooms. Features classic styling which would look great in any traditional bathroom. Each individual piece of sanitary ware has been carefully considered in its design, being based on authentic original pieces and lovingly re-created. Features the Silverdale logo on the cistern and comes with a lifetime guarantee against manufacturing defects. Available with either chrome, incalux (Gold) or polished nickel luxury high level fittings kit. 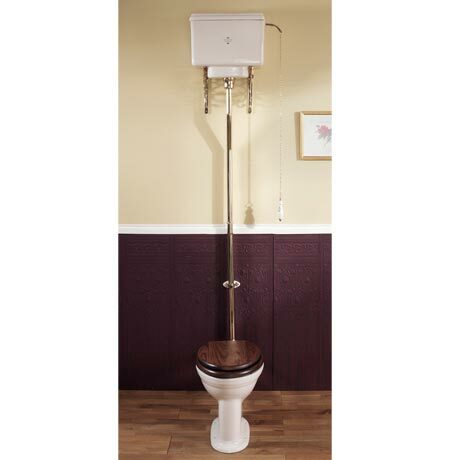 Fittings kit includes - flush pipe, brackets, ceramic disc & ceramic pull handle with decorative lettering. Supplied with a quality traditional high level fittings kit.